SINGLE PARENTS- If you are a single parent, you already know you have one of the hardest jobs in the world. Trying to be both dad and mom--breadwinner, cook, chauffeur, comforter, dish-washer, homework helper, disciplinarian, nurse, and role model--can wear down the hardiest man or woman. But do you know that God, in the Bible, offers words of grace, power, and hope especially for you? 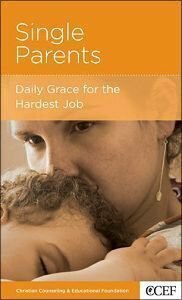 Robert D. Jones addresses the many different issues that single parents struggle with--guilt, bad memories, anger, bitterness, resentment, loss, grief, and fear. Then he shares biblical truths and practical parenting strategies that will give you hope and direction for each day. About "Single Parents (Christian Counselling & Educational Foundation Series)"